We have expanded the programme and now work with 6 local schools and we have plans to continue expanding through 2019! We have been really enjoying the lovely weather in Portsmouth for the start of our Autumn programme here at PSTT. 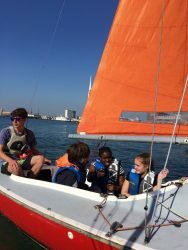 Currently we are working with four schools, taking groups of young people sailing weekly and as you can see from the photo here they are really enjoying being out in the sunshine and on the water. As we all know, being outside in or on the water and taking part in exercise has so many positive benefits. 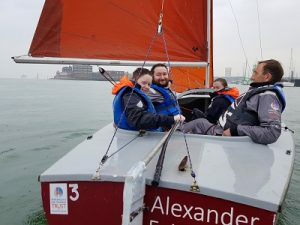 These young people experience a boost in self confidence from trying out something new, have positive social interactions as they work together as a team to sail the boat, and learn resilience as they overcome the challenges of learning a new sport. All of this – and it’s lots of fun as well! Just before the schools broke up for the summer, Portsmouth Sail Training Trust hosted the annual HMS Bristol Regatta in Portsmouth Harbour with the prize giving on board HMS Bristol, Whale Island. There was some excellent and close racing with students from Miltoncross Academy, St Edmunds School and Charter Academy; all showing how much they’ve learnt about sailing throughout the year! 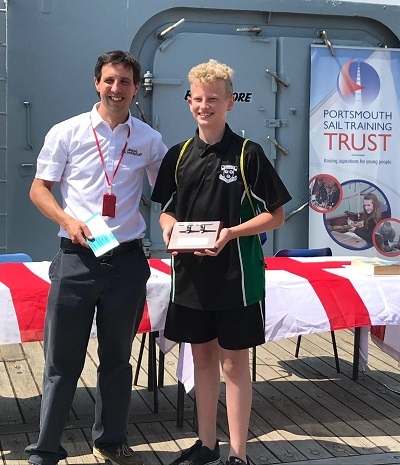 We invited lots of supporters and donors as well as the local press and parents to join us for the prize giving, with Charter Academy taking the overall winning school award, and Matthew Brittan from St Edmunds School taking the coveted Haslar Marina award for the Standout Achiever of the year! 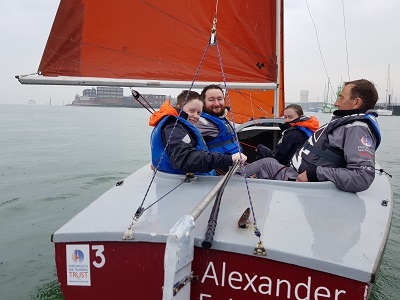 Portsmouth Sail Training Trust hosted local inner-city school St Edmunds for their first ever Aiming High sailing session just before half term. They are looking forward to their next one this week! 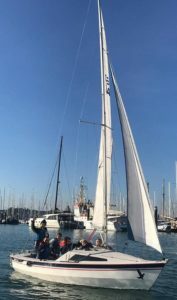 These sessions are aimed at children who suffer with physical or mental health disabilities, it gives them the chance to try and learn sailing when they might not have had the opportunity to before. They all had a brilliant time despite the rain and are looking forward to coming back. 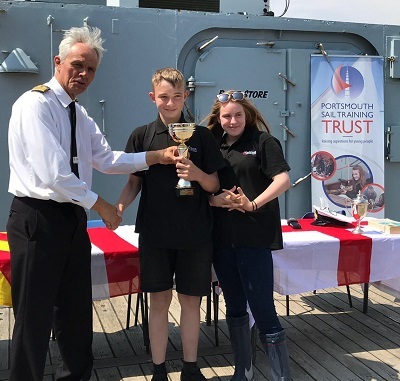 This is just one of the charitable programmes supported by the Andrew Simpson Foundation and with the operation of the PSTT we are looking forward to giving access to sailing and water sports for many more children to come. Posted June 2018. “With the recent spell of good weather, we have been really loving getting more and more Portsmouth young people out on the water. 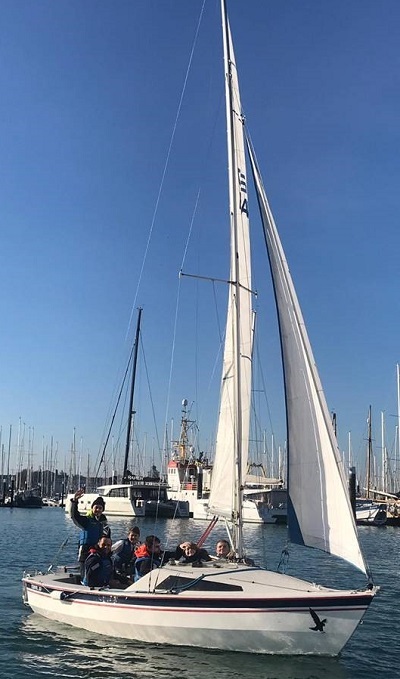 Pupils from Ark Charter Academy have recently started an after school sailing club from our base in the Naval Dockyard and they are pictured here (sailing with Instructor Ciaran) enjoying the sunshine in our squibs sailing out of Haslar Marina". 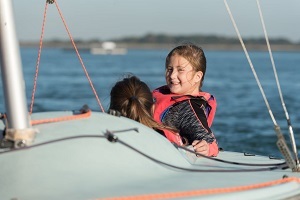 Through this club pupils will learn to sail and achieve their RYA Stage 1 Keelboat Sailing Certificate, but also will learn and develop a whole host of life skills such as communication, team work, building resilience, decision making and problem solving. If you would like to set up a sailing club for your school or group please contact us. Posted May 2018.